Former district judge Rodolfo “Rudy” Delgado will remain on the November ballot for the 13th Court of Appeals, despite speculation he would drop out of the race following his indictment this spring on federal bribery charges, and after facing pressure from the Democratic party to do so. Delgado did not withdraw by the Aug. 24 deadline set by the Secretary of State’s office for the Democratic party to nominate a replacement candidate, who would have taken his spot on the ballot for the Place 4 seat on the appellate court. “Even if he tried to withdraw at this point, he will still be on the ballot,” Communications Director Sam Taylor of the Secretary of State’s office wrote in an Aug. 28 email. Delgado is running against Republican Jaime Tijerina, who the governor appointed in June to temporarily fill the vacancy in the 93rd District Court following Delgado’s April resignation until a new district court judge is elected in November. While Delgado has remained in the news since his Feb. 5 arrest — when he was detained while on his way to a campaign event in Goliad County — he has kept a low-profile, despite being indicted on new charges to which he has plead not guilty; his trial is tentatively scheduled for February 2019. Attempts to reach him through his campaign manager, his wife, as well as his attorney were unsuccessful. It is unlikely he will actively campaign for the appellate justice position despite his name remaining on the ballot. His campaign signs have all but disappeared since his arrest, and he has only received $100 in campaign contributions, according to a July 16 campaign finance report covering the period from January to June. 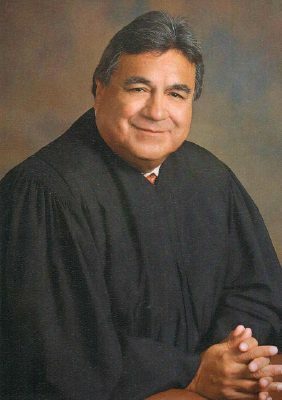 Per the conditions of his release from jail on bond, he must seek permission from the U.S. District Court for the Southern District of Texas to leave Hidalgo County, and according to federal court records, none of his requests have involved campaign events in the 19 other South Texas counties under the appellate court’s jurisdiction. Tijerina, on the other hand, spent much of this past week distributing yard signs and posting signs along the county’s major thoroughfares. Such activity didn’t begin until it became apparent that Delgado was not exiting the race. “The strategy really doesn’t change … Our objective is still to work as hard as possible to get out the vote in all the counties, especially Hidalgo County, so we can push 51 percent of the vote,” Tijerina said, adding he plans to visit all the counties in the appellate court’s jurisdiction over the next two months, having done so in advance of the March primary. One challenge he must overcome in Hidalgo County, a Democratic stronghold and the largest county in the court’s jurisdiction, is the prevalence of straight-ticket voting. “But I can’t imagine (how) a voter who typically votes straight ticket can in good conscience do that again knowing some of the people that they will elect,” Tijerina said, adding that while Delgado’s federal indictments won’t be the focus of his own campaign, which focuses on his qualifications and public service record, “you can’t ignore the problems that (Delgado) has or at least make the public aware of the pitfalls of voting straight ticket. “We are forced to choose a political party when we run for judge (in Texas), but party politics don’t have anything to do with following the law … part of my judicial philosophy is that I’m loyal to one thing, and I’m loyal to the law,” Tijerina said. Early voting in the appellate court race begins Oct. 2 and runs through Nov. 2. Election Day is Nov. 6.